I've purchased some "less expensive" bumper plates in the past and they lasted about six months before they began to fall apart. What assurance do I have that the better ones won't? Answer: This is a question we hear a lot. The simple answer is our warranty. Most of our bumper plates have a 5 YEAR WARRANTY. This is perhaps the best in the industry. But perhaps the better proof is looking a the customers we have served and the reputation or plates have earned. Some of our plates are still in daily use after 12-15 years of service. Customers are amazed that with proper cleaning, the plates look brand new. We want your facility not only to look good on day one, but for years to come. 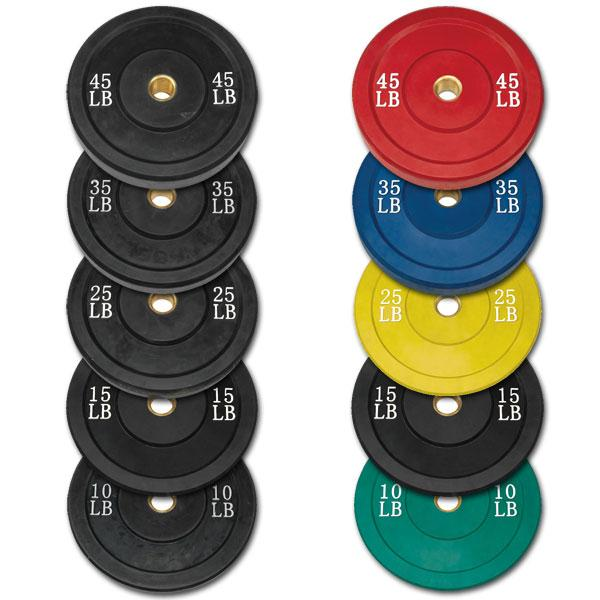 I've heard some information on durometer measurements and their impact on selecting bumper plates. Could you explain? Answer: Durometer measurements are used in the manufacturing process of the rubber portion of the bumper plate. Rubber durometer measurements are done on a 0-100 scale. For practical purposes these range from 30-90. The lower the number the softer and the higher the number the harder. for a bumper plate, the best range is about 78-80. If a bumper plate is too low on it's durometer is becomes like a bouncing rubber ball. If it above 80 it become rock hard and can potentially damage platforms as well as being very loud when it is dropped. Just remember that the durometer measurement is like Goldie Locks and the porridge - not too hot, not too cold, just right. I'm thinking about getting custom lettering done with my bumper plates, is there anything I should be aware of? Answer: We were one of the first companies that began to offer custom lettering on bumper plates. To be honest, we made a lot of mistakes in trying to come up with a system that is unique to the needs of lettering on rubber surfaces. 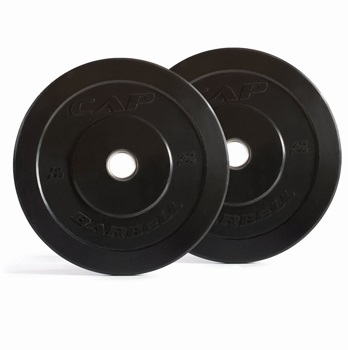 Bumper plates have a couple of unique challenges that you don't encounter with lettering systems on urethane style plates. The first is the material itself. The rubber used in bumper plates is somewhat of a "live" material. There are gases that are constantly emitted out of the rubber making it a challenge for any material to effectively bond to the surface. Secondly is the movement and use of the bumper plates does not make it conducive for post application lettering systems? As a bumper plate is dropped, the rubber moves in all three X/Y/Z directional planes. The lettering material must be able to absorb these forces or it will crack. This is one of the big differences in doing lettering on urethane plates vs. bumper plates. Since urethane plates are not designed to be dropped, you do not encounter the challenges of movement distortion of surface materials. This is why silk screening or traditional paint color infills do not last. With our lasering method we use a special dye solution that allows movement with the rubber as it displaces. We are the only company using this process with our lasering system. In addition, we have recently developed a new system call "rubber infusion lettering" (RIL). This unique, patent pending system, allows us to infuse color rubber lettering or logo into the rubber mold at the time the bumper plate is made. This is the best permanent fix or solution to lettering on bumper plates. Since the rubber is part of the plate, it cannot rub off, peal, or fade. This system will revolutionize how lettering is done on bumper plates. 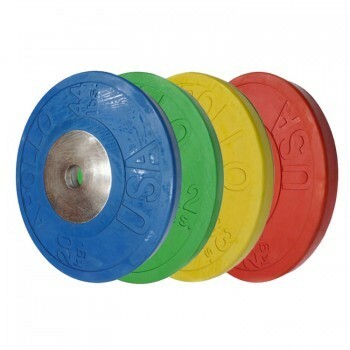 These bumper plates are exceptionally durable and have a very low bounce. German urethane is used to ensure the highest quality and bright, vibrant color. 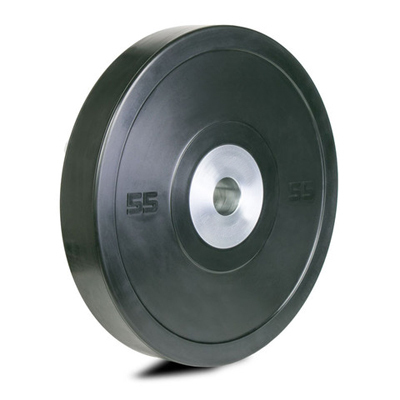 The Training Bumper Plate offers performance and durability for a variety of applications. 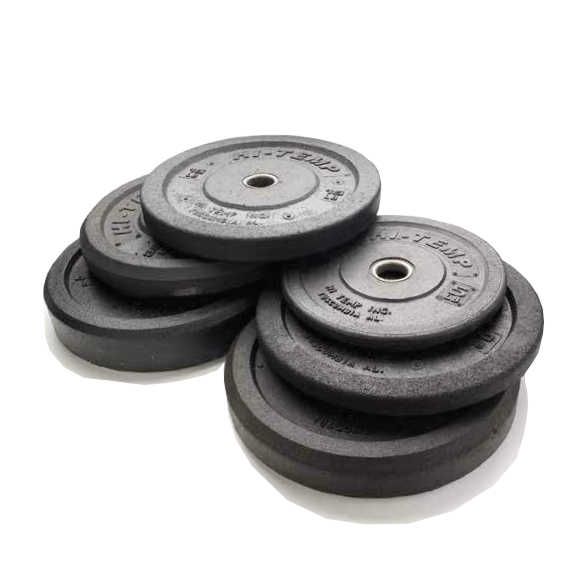 These bumper plates come with a one piece boltless hub to ensure a strong bumper plate despite repeated drops - a top choice for any weight room. 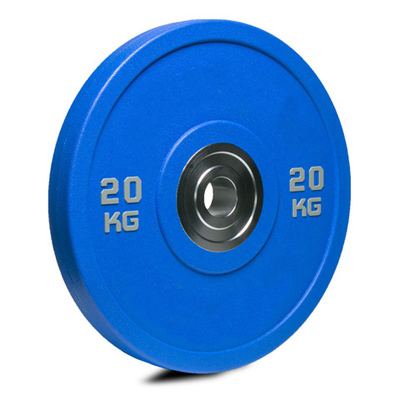 These plates are ideal for Deadlifts, Squats, Bench press etc. The highly durable pulverised rubber construction not only makes this plate hard wearing but also helps protect flooring - the rubber is combined with a polymer adhesive that is molded using a high intensity heat compression technique. Pendlay HD Bumper Plates are perfect for any environment. 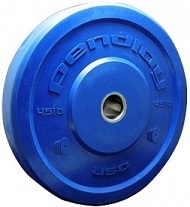 These bumper plates have great durability in high traffic gyms. There is very little bounce with these bumper plates so you can maintain control of the weights when they are dropped. 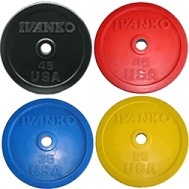 The Ivanko OCB series weightlifting discs are extremely accurate and durable and meet the International Weightlifting Federation specifications for weightlifting plate. Made with recycled rubber and a stainless steel bushing for long life and durability. Ideal for indoor or outdoor use. Standard diameter 171⁄4” (*5 lb bumpers diameter is 141⁄4”). Sold individually. 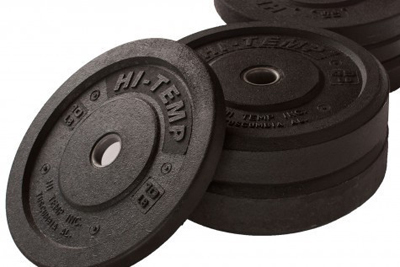 Hi-Temp bumpers have been a staple at affiliates for years because of their incredible durability. Grab a set of American made Hi-Temp Rogue bumper plates and take your lifts to the next level. Keep your workout area neat and organized no matter how much weight you throw around with the Bumper Plate Rack. 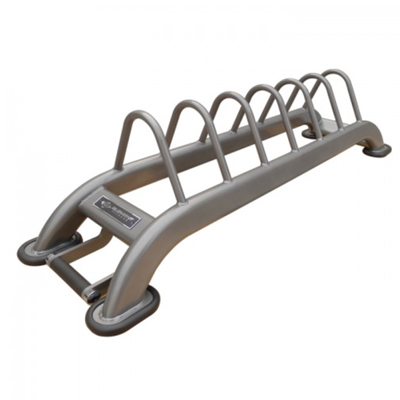 This bumper rack offers a portable solution to your bumper plate storage needs. 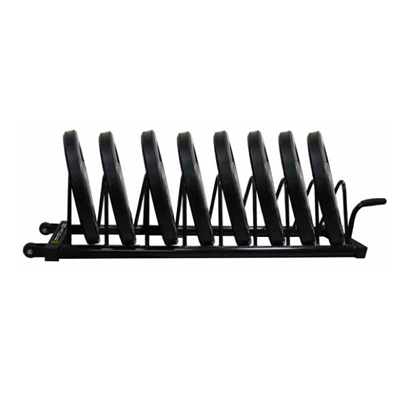 This commercial bumper rack is ideal for high school, college, power lifting, military and commercial gym use. Keeping your gym organized and clean can be a big challenge for owners and coaches. 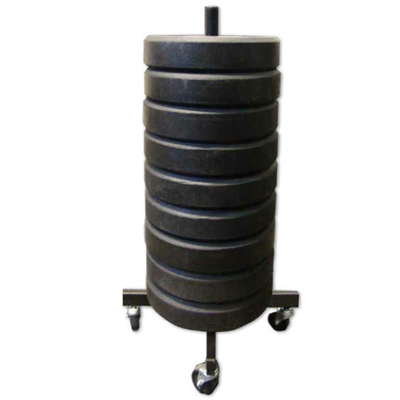 This Bumper Stand is the best way to store bumper plates vertically without consuming a lot of space.